The American people have spoken and Cobbler has been voted the 2012 National Thanksgiving Turkey. 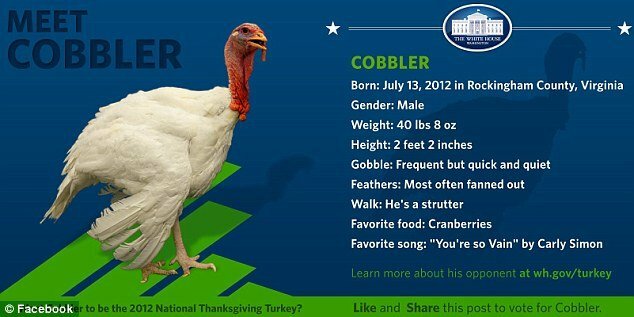 The moment of truth in Thanksgiving Decision 2012 came on Wednesday at the White House National Thanksgiving Turkey Presentation, as President Barack Obama announced that Cobbler was victorious over his competitor, Gobbler, though both are winners as neither will face the chopping block. They competed for the coveted role in a massive social media campaign with Americans invited to cast their ballots to decide which animal should receive the title. Even though Gobbler failed to nab the top prize, he will serve as an alternate in case the official bird cannot fulfill his duties. President Barack Obama was joined by the first daughters, Malia and Sasha, to announce the winner. “They say that life is all about second chances,” Barack Obama told a crowd of Thanksgiving revelers and reporters at the White House Rose Garden on Wednesday. “This November, I couldn’t agree more,” he said, adding that “once again Nate Silver completely nailed it”, referencing the New York Times blogger and celebrity numbers whiz who was spot-on in his election prediction on November 6. Cobbler, the winning bird, voiced his delight with several gobbles that were heard throughout President Barack Obama’s speech. The president joined his two daughters, Sasha – who was eager to pet the bird – while Malia decided to keep her distance, to officially offer a presidential pardon. The presidential tradition of offering clemency to a turkey has been in place since 1963 under President John F. Kennedy. But this year, the White House invited the people to let their voices be heard. 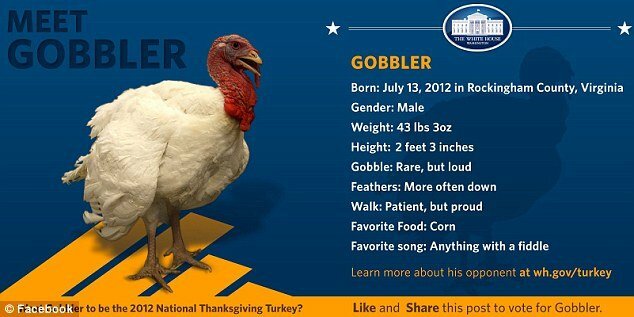 Early Tuesday, the official White House Facebook page posted a picture encouraging users to vote for which turkey should be the official bird of the 2012 holiday – Cobbler or Gobbler. The White House blog compiled a short biography for the two birds, saying that both were born on a farm in Rockingham County, Virginia. By Wednesday morning, Gobbler, a 43 lbs male with a “rare but loud” gobble, had amassed 2,223 Likes. Gobbler was described as having a walk that was “patient but proud”, according to his profile. But Cobbler seemed to be the favorite, having garnered a few hundred more Likes on Facebook, bringing his total to 2,512. The 40 lbs male was described as having a gobble that is “frequent but quick and quiet”. He stands at 2 feet 2 inches and according to the profile compiled by the White House, his favorite song is You’re so Vain by Carly Simon. Though there can only be one winner, the remaining turkey won’t be served up at a feast. Following the pardoning, both turkeys will be transported to Mount Vernon, the estate of George Washington, where they will be placed in a custom-made pen at the livestock facility. But PETA (People for the Ethical Treatment of Animals) is crying foul – saying the Commander-in-Chief should put a stop to the “sorely outdated” ceremony and have asked the president to opt for a Tofurky roast at his Thursday feast instead. The animal rights activists have decried the practice, accusing the president of a having “partnership with the turkey-killing industry”. 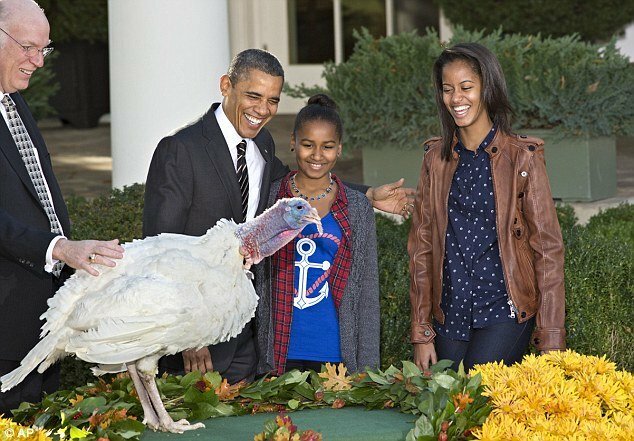 PETA President Ingrid E. Newkirk wrote to Barack Obama, saying that the annual turkey pardon “makes light of the mass slaughter” of each turkey and “portrays the United States president as being in some sort of business partnership with the turkey-killing industry”. She wrote that Tofurky – turkey made from tofu – is a “delicious, healthy” alternative to eating a turkey. By Tuesday night, Ingrid E. Newkirk said that she received no official answer from the White House, though on the official White House page for the ceremony it was clearly stated that “no turkeys will be harmed during the selection of the National Thanksgiving Turkey”. “It’s all gravy,” the event planners announced.